Barbara Rudolph Fine Art: BIRD SERIES - "WOODY"
My father had a wonderful hobby of carving birds that he became quite good at. For years he would always say to me that I should paint some birds. I really wasn't interested however in that as a subject matter at the time. I continued on my way to paint just about anything except "birds." He suff ered a series of strokes just over a year ago, and really was not able to recall his memory of that hobby. One day last fall I decided to paint a little bird to bring by for him to look at, and to see if it would stir up his memory a little bit. He smiled a big smile and nodded an approving nod, so I began my "bird series." I have since sold the one I named "Roy" after my dad, but will continue to enjoy watching and painting birds now for as long as I am able. They are so much fun to paint. 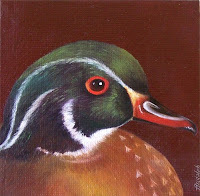 This little oil painting is of a wood duck, and is 4"x4".